Now back to the boring and obvious races for Congress, we move on to the 48th Congressional District which covers coastal Orange County. This seat is currently a Republican stronghold with a 17 point registration advantage. Also, in 2008 and 2010 Republicans one every single major race in this district. Even after redistricting took place, it is clear that this seat is not in play. DTS voters in this district almost outnumber Democrats, lagging by just 7 points in registration. 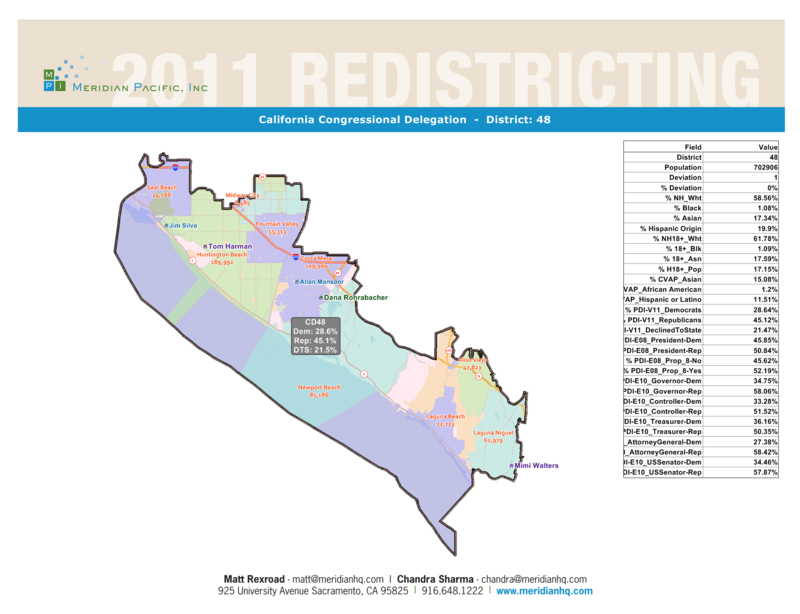 Incumbent Congressman Dana Rohrabacher has represented a portion of this district as part of his old one. He also picks up some of the old parts of the old John Campbell district. With the amount of name ID he has it will be very tough to see a candidate put up a serious fight in this race. I don’t know why, but I genuinely dislike his website. My hope is that he switches to something a little bit less busy. Ron Varasteh an Engineer/Small Businessman who is running as a Democrat. Alan Schlar a Marketing Sales Executive who is running with No Party Preference. Between the other candidates running it comes down to a couple of factors. Do Democrats turn out to vote at a higher rate than DTS voters? Do Republicans who perhaps are more moderate vote for the (NPP) candidate instead of Rohrabacher or Varasteh. This entry was posted on April 12, 2012 at 11:41 AM	and is filed under 48th Congressional District. Tagged: Alan Schlar, Dana Rohrabacher, Ron Varasteh. You can follow any responses to this entry through the RSS 2.0 feed. You can leave a response, or trackback from your own site.